As UX Consultant and Interactive Designer I research, analyse and define the best user experience for the customer's target audience following user and stakeholders expectations and best UX practices in the market and deliver interactive prototypes and UX functional specifications for designers and developers. As Visual Designer I design creative websites and mobile applications where I'm highly conceptual but emphasis on details (pixel perfect) with the ability to communicate graphically complex ideas and deliver excellent quality visual solutions on smaller screens. Interview sand meetings held with the project and stakeholder teams to understand the projects objectives and how it will be measured. Outputs: Summary of business requirements, user cases and key peformance indicators. What are the user needs from the project? Observation and research with users to understand who they are and how they think. Analytics and search log review to understand existing patterns. Outputs: Personas, user profiling, task models, competitor benchmarking report. 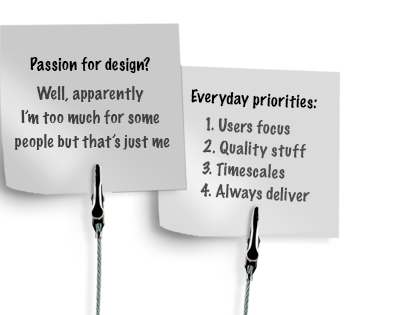 How to align the business and user needs? Workshops with the project and stake holder team to understand the research, discuss objectives and make the idea concrete through sketching and concept designs. Outputs: Prioritised objectives, roll-out plan and visualisations. How does the site feel and look to use? Initially the focus is on the information architecture, content, user journeys, sketching and wireframes. Then on the application of the brand onto the design and validation of the chosen routes. Outputs: User journeys, content requirements and copy, sitemap, wireframes, visual designs, HTML prototype, usability testing, testing reports and delivery assets with spec document for developers. Analysis, testing and improvement on an ongoing basis to optimise the user experience and site performance.